Nothing is worse than not having enough time in the morning to wake up and start the day. Getting ready under pressure of time, having a quick breakfast or eating nothing at all is not ideal for health - and for weight. If you don't eat very well in the morning, you will be hungry later - and you will eat too much. If you take your time and consciously approach the morning, you have more energy and can look forward to the day calmly. It's little things that can help you wake up and stay awake. A balanced sleep rhythm during the week is healthier and provides more relaxation than irregular bedtime. Between 7 - 9 hours of sleep are considered optimal. Incidentally, sleep deprivation can lead to weight gain due to metabolic processes, such as it has been shown in a study by the University Leeds. 2. GET UP - EARLY BIRD ! Getting up in time, because staying in bed for longer is no good if you have to rush to a hectic pace. Rested feels different. 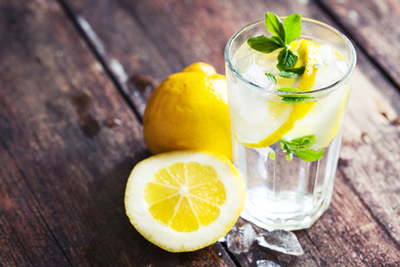 Drinking water stimulates the metabolism, preferably still flavoured with lemon slices. Tastes good and has a positive effect on health thanks to vitamin C.
4. START THE DAY RIGHT WITH EXERCISE ! 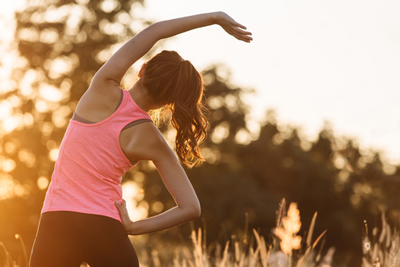 Either a light workout or yoga in the fresh air will get you going. The circulation is stimulated and the body is flooded with oxygen. 5. COLD WAKES UP ! A cold shower also wakes you up, and those who don't like that can try it with a hot/cold alternating shower - a nice side effect: The circulation is stimulated and tightens the skin. 6. PREPLANNING IS EVERYTHING ! Plan what to wear the night before. Saves valuable time in the morning, and you don't have to waste time standing helplessly in front of the wardrobe and desperately wondering ,"What should I wear?" 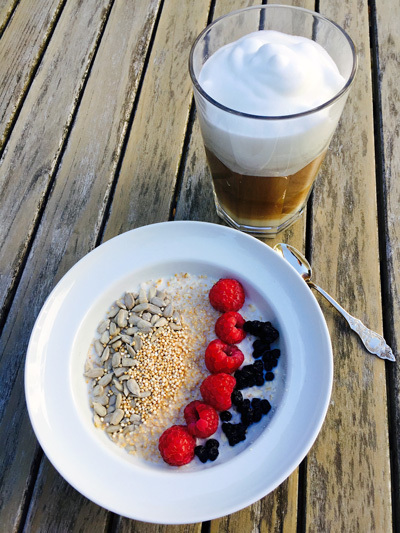 Breakfast brings more energy for the day than the 10 - 15 minutes more sleep. And this should be really nutritious with as much vitamins and minerals, carbohydrates, proteins and fibre as possible - but also naturally delicious. It saves time to prepare things for the evening before. Perhaps prepared with cereal flakes as Overnight Oats? They are super practical: Get out of the fridge and then only spice up with fruits and nuts if necessary. Liquid also works well: smoothies are unbeatable here because you can eat a lot of different nutrients relatively quickly. On Instagram you can find countless inspirations for Breakfast-Bowls, which are beautifully decorated and a delicious eye-catcher. In recipes you will also find healthy ideas for a perfect start your day right.